The off-season has come to an end and you’re back to the grind of touring again. Hopefully you used a good off-season program to recover well from last season, make physical gains to improve your game, and properly prepare yourself for the rigors of this season (if not, give me a call quick and we can start before it’s too late). 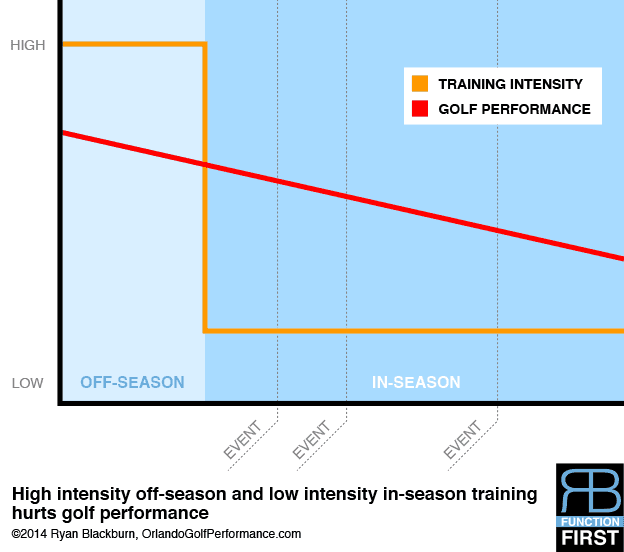 I wanted to write today to help you understand how a workout program shifts as the season starts and how to maintain your game and your health throughout the season. Before we get too deep into this I want to look at the two extremes of the workout mindset spectrum. On one extreme are the golfers that work out in the off-season but are afraid to lift in-season, scared it will make them sore or weak and hinder their game. These players are likely to start their best and most consistent and then as the season goes on they hit shorter and get more streaky in their play. Their risk of injury goes up as the season goes on. Every off-season they start at the same place (or sometimes worse) because all the progress they made last off-season has been long since lost. On the other extreme are the players that “go hard” all year round. It’s hard to tell how this manifests in their game because they are never fully recovered. They play sore and play fatigued. They never play to their potential and are at a constant risk for injury; there are always swing compensations present because their bodies will alter their swing to avoid weakened and sore muscles. Consistency is almost unattainable since every time they play, a different set of muscles is fatigued from their most recent workout. Most players don’t fall exactly into one of those extreme categories (at least I hope not). However, I’m sure as you read those descriptions you can identify a little more with one than the other. The goal is to balance the two extremes. This is called periodization. You should work out ALL year! Yes, in-season and off-season. What changes isn’t whether you work out, it’s the intensity at which you work out. How to intelligently balance this is where a good sports performance specialist comes in. For my players in the off-season, we go hard often and try to make the big gains then. As the off-season ends we start tapering off the intensity but adding more challenge and building in more resiliency/durability for the season to come. In-season is a more delicate balance. If there is a short break between events we might only do a few days of corrective work and some light strength training – nothing that will leave the player sore, weak, or alter their swing in the couple days of practice they get. One of my favorite quotes from a great performance expert named Pavel is: “Training should leave you ready to fight for the kingdom. Not like you just lost the war.” It describes these types of workouts perfectly. If there is a longer break we might do one day of corrective work and light training, work hard one to two days, then a light day before they leave. If they are traveling from event to event without being able to see me I’ll give them more stretching work and a hotel workout to do on their own since long hours of traveling wrecks the body and needs to be seriously counteracted before practicing and playing. This whole process is highly tailored to the individual and their schedule. As I said it is a very delicate balance and it is one of the reasons pros hire people like me to do the planning for them and trust that I am getting them the best results and preparing their body to the highest potential. I hope this helps you in your own planning. If you need further help feel free to contact me.